Catalina has a practice of making the cockpit side benches long enough to sleep on and the 355 seems to have added a few more inches. A great space for a twilight racing crowd, with a couple more seats incorporated in the pushpit. For less hectic times a table ahead of the console folds up to take drinks, stored in ice perhaps in the insulated compartment below the table. Instruments live in panels either side of the cockpit, convenient for the helmsman but not taking up space in the console. With just a monitor ahead of him, even a short seated helmsman has a good forward view. Cockpit occupants have a clear space, with the mainsheet on a 5ft traveller ahead of the main hatch. This is a beauty, with a ball bearing car and 6:1 adjuster, both lines leading to one side. The interior is a comfortable mix of teak, much of it solid, and synthetic surfaces – low maintenance and well lit both naturally and electrically. 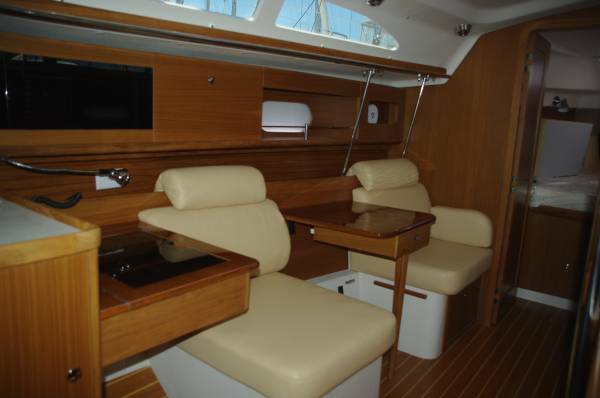 Most serious cruising is done with two or four aboard, and the 355 is set up with four permanent double berths. The owner’s cabin forward features an innerspring mattress (with fitted sheets courtesy of Catalina), decent deck space, and a cedar-lined hanging locker. The aft double cabin has a jumbo sized bed, plenty of windows, and an escape hatch to the cockpit. The large saloon provides better than acceptable casual sleeping for another three. A two-seater dinette converts to a single, and the full-size dinette opposite to a double. The rest of the time the area is an extremely comfortable conversation spot, the quad fold main table moving between dining drinks and coffee modes. The smaller dinette provides the seat for the navigation table - a thoroughly modern take on the concept. The table has a recessed laptop compartment, and alongside are all the ports. In the same area is the switchboard that lives behind a glass door. 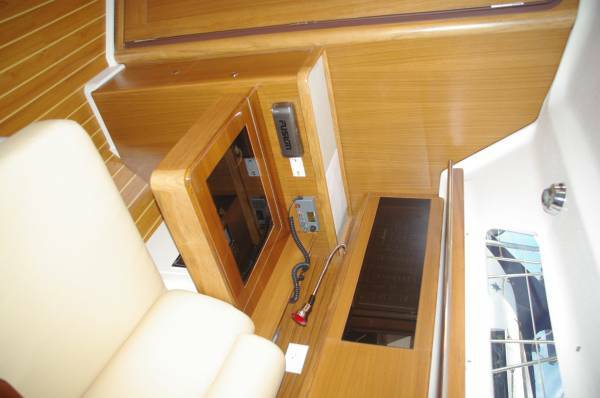 The rest of the interior is given over to bathroom and galley. The roomy bathroom is constructed from a single moulding, making cleaning a simple job. 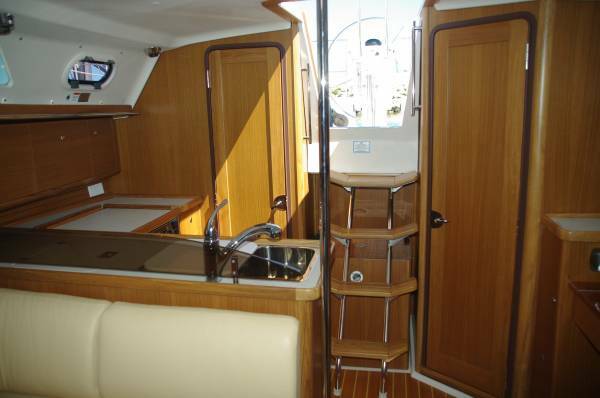 Its toilet is full size, the shower and wash basin usable without the common yacht contortions. The galley operates along similar lines: a bit smaller than shore-side, but nothing Mickey Mouse about it. The two-burner stove plus oven is gimbal mounted, the big fridge-freezer is L-shaped in section and has top access plus a door, and the sink is double and deep. The rig uses two spreaders, three pairs of shrouds securing to ball and socket chain plates that are set well inboard. This arrangement supports a deck-stepped mast that carries 62 sqm of sail. 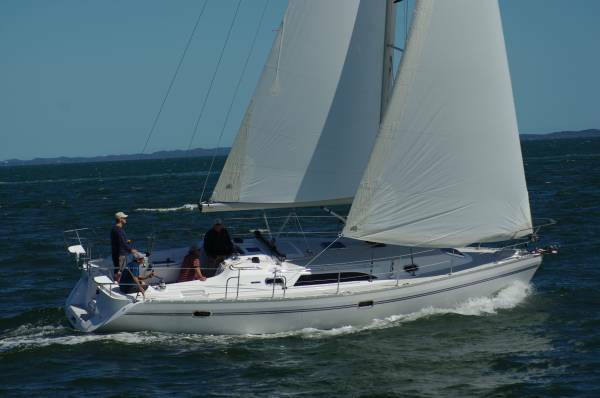 The headsail has the usual roller furling, the main the less common but far from rare in-mast furling. 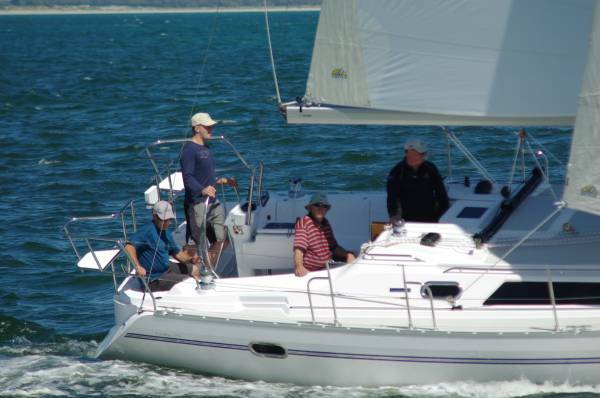 Some in-mast systems have been prone to jamming, but the Catalina’s Selden furler has been widely claimed to be nearly foolproof (until they invent a better fool). On our 15 knot or so day, everything worked like a charm and lent itself to single handing, which cruising so often effectively is. If any fault had turned up with main furling lines we had the option of attaching a winch handle directly to the mechanism. Everything was effortless: the big diameter wheel gave fingertip control and let the helmsman position himself wherever was optimum; fine tuning the traveller controls was no task at all. Movements around the deck were secure, with recessed grab rails everywhere a hand was likely to fall; surfaces forward were friendly for sitting on. Every new yacht that turns up seems to make better use of space and offer a little better performance. When it does it with such a friendly price as the 355’s $220,000, it is welcome indeed. Big enough for full-time live aboard and for world-wide cruising at a weekender’s price. Plenty of room for day sailing, and should put up a good performance in the handicap fleet.